Woohoo! I got to pick the winner of my 1st giveaway! First... thank you ALL for your great comments and blog love! I am having so much fun reading all of them. I have all your "wants" written down and working on inspiration for ya! Thanks!! I absolutely love your blog! 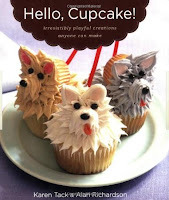 I found it off of Melinda Ford's blog - "All Things Crafty and Delicious". I would love to see a cupcake themed party and more with baby showers. I'm constantly throwing baby showers for new moms at church. Thanks for the great giveaway! I just took a cake decorating class this past winter and would love this book for some inspiration and decorating ideas. Thanks! Also... keep your eyes out! I have a REALLY fun giveaway lining up in less then two weeks!